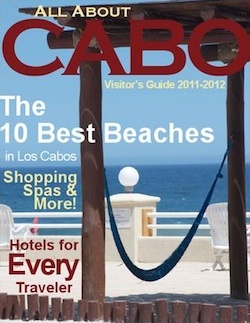 All About Cabo is proud to present our 2011 – 2012 Visitor’s Guide to Cabo San Lucas Mexico. Inside our Cabo guide, you will find every thing from travel tips to information on the hottest bars and restaurants in Los Cabos. The guide is interactive so be sure to click links to find out more about certain topics or to visit one of our partner’s websites. Please enjoy your exploration of Los Cabos. To properly view the All About Cabo guide, please click the expand button below. If you would like copy of the All About Cabo Guide for yourself, please see the information below. Having a printed copy of the visitor’s guide is great for travel agents, trip planners or just have before you are headed to Cabo! All About Cabo’s Visitor Guide is complete guide to the Los Cabos region. It contains tips on where to stay, what to do and where to eat. The All About Cabo Visitor’s Guide is copyright of All About Cabo and Iguana Interests LLC. 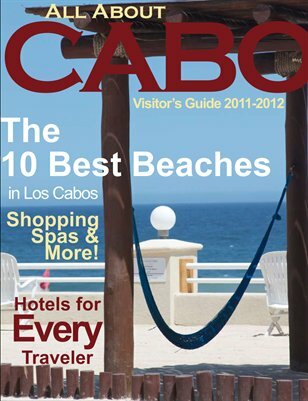 If you are interested in advertising in the All About Cabo Visitor’s Guide, please Contact Us.